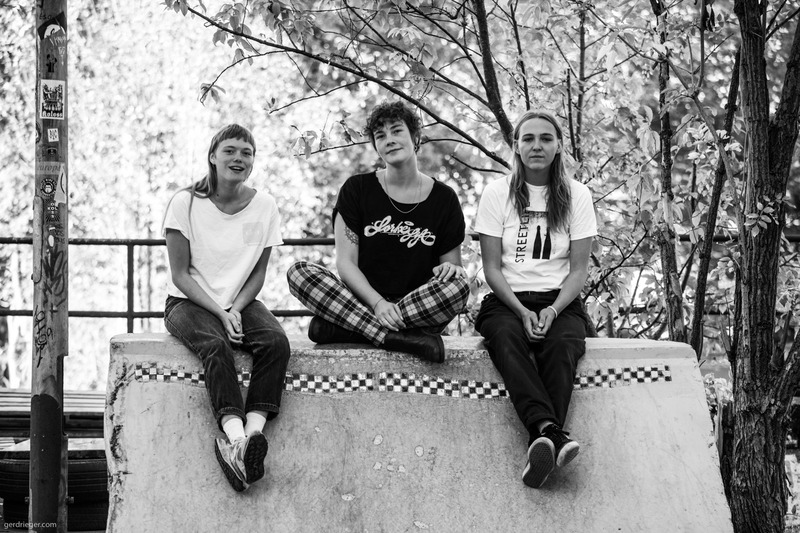 Lisa, Lisa-Marie and Meike hannging at their local spot – the DOWGY ALLEE DIY. My name is Meike, I am 25 years old and will become an educator. I’ve been skating for 4 years now. My name is Lisa, I am 28 years old and studied graphic design. Not calling myself a skater but beeing a friend of the scene since 2013. Hi my name is Lisa-Marie, I am 25 years old and in my graphic design masterprogramm right now. For me it’s the same with skateboarding like the other L – ever since surrounded by people who skate and drink beer. Best education though – I think that’s a big part why I see ourselves as such strong women/personalities. You have push through no matter whether man or woman. How did the idea to make a zine come about? Meike: It was basically Lisa’s idea a few years ago. She and a friend were brainstorming about a project to create something to capture the last years of Münster’s streetlife and skateboarding. 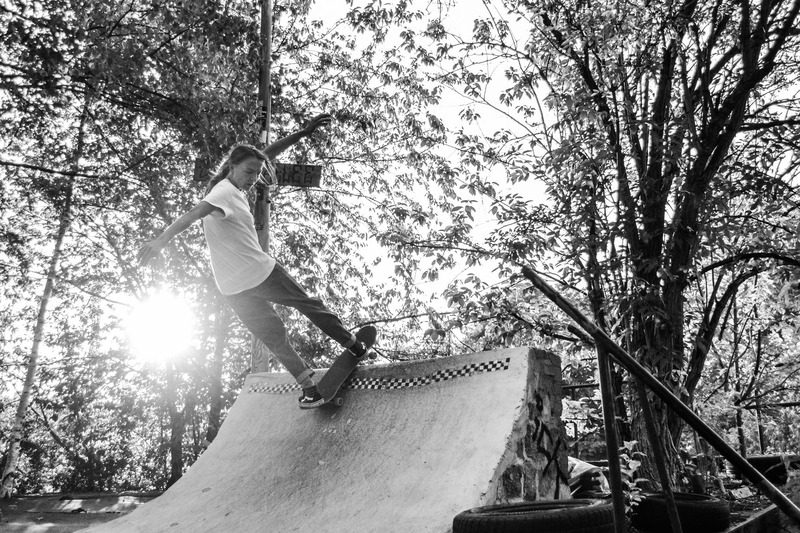 Lisa: As we three all are part of the Skatescene in Münster, we knew that there is a huge amount of photographs and stories, that would be worth to get celebrated in a printed medium. Meike: When we met, it became real pretty fast: Both Lisa’s as the editorial and design specialists and me as someone who skates and likes to write and to connect people. 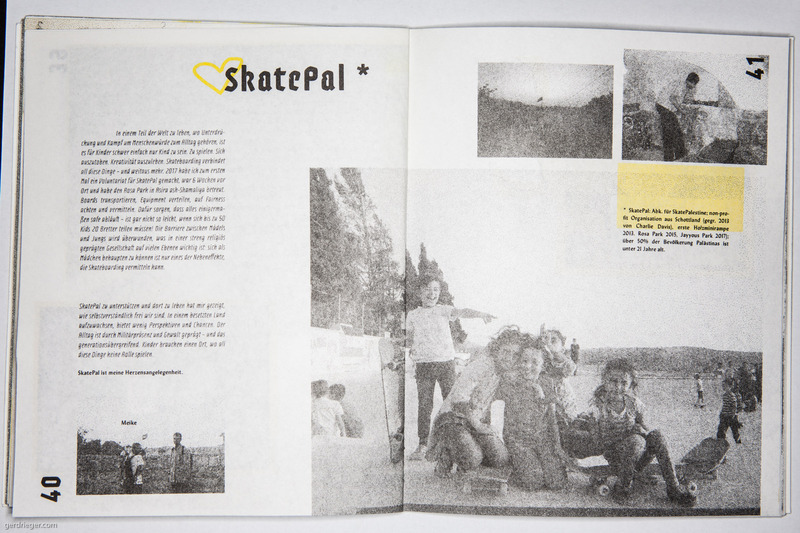 Lisa-Marie: We wanted to appreciate all these photographs and the hard work you can see on them, whether building or skating. Every photo is worth to show on printed paper what the DIY scene build up in the past years on their own. It’s like a loveletter with recognition to everybody who contributed. How did you come up with the name Petrophil? What does it mean? Meike+Lisa: Petrophil is a biological adjective combined out of two greek terms (petro = stone and philos = loving; friend). It stands for organisms who prefer living on concrete and stones – like for all the human creatures out there the magazine is dedicated to. What´s special about concrete? Building and skating it. 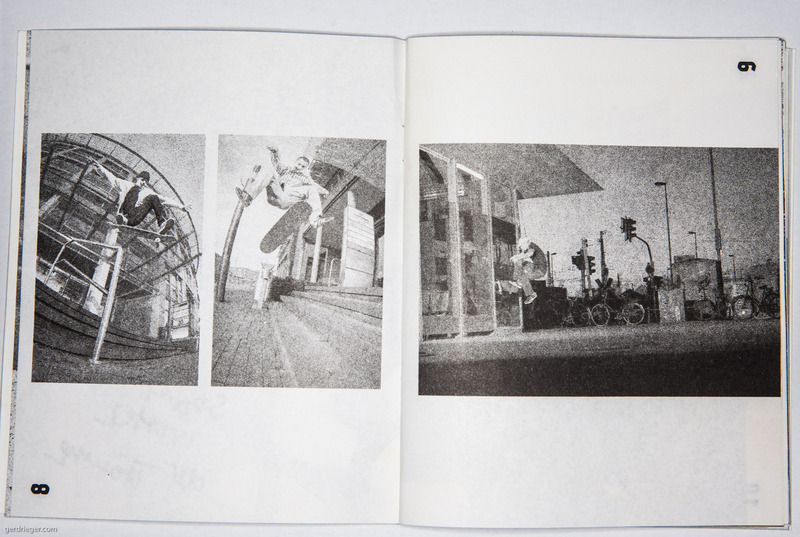 Meike: Concrete is a fascinating material – you buy it powdery, add water and can create whatever you want to skate. You can watch its haptic change within the hours. Skating obstacles you built with your own hands and a bunch of good friends makes you get a close connection to the spot. And in the end you built something new. This was your first zine right? Lisa: Yes, it was our first one, but hopefully not the last. As we had huge fun creating it and organizing the event, the release party for it. Lisa-Marie: There is still a lot of unseen and unused photographs which are waiting for uns to print them. And of course the construction work goes on really fast, so there is again new stuff to write about and get it printed. We are really looking forward to start the second issue. Tell us a bit about the process making of making a zine. 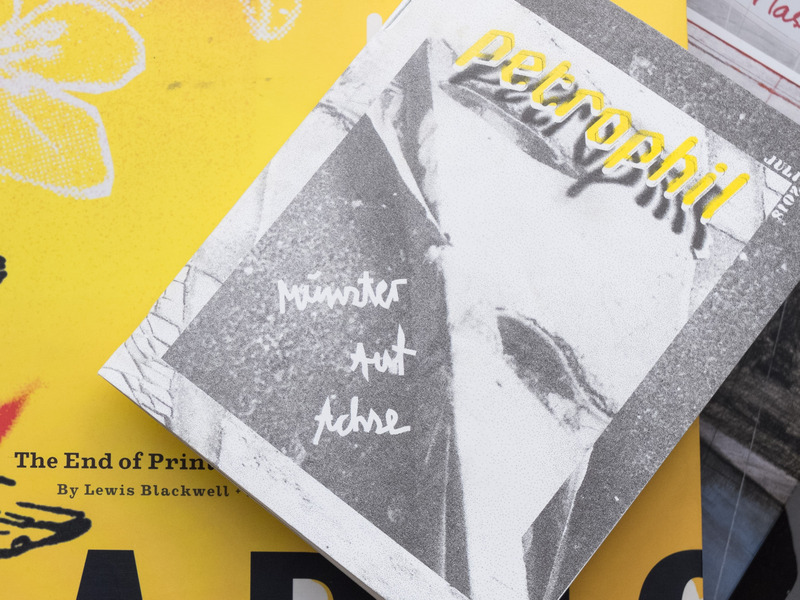 Meike: When the idea behind petrophil became tangible, it was pretty clear that we didn’t want to make a magazine just on our own: we started an open call via Facebook and told all the guys to send us pictures, sketches and stories to share. We wanted to guarantee that those who are part of the scene could get involved and be a part of creating it. In the end we were overwhelmed by how much we got. We picked the contents, designed the layout, did the interviews. It was all a process of getting inspired on the way. You chose a special printing process. What was it and why? Meike+Lisa: Printing with a risograph is special because every page is unique. The silkscreen-based technique allows you to play with the printing colors you pick and the effects it has on bright and dark levels of photos. It was the first time we worked with this special method. 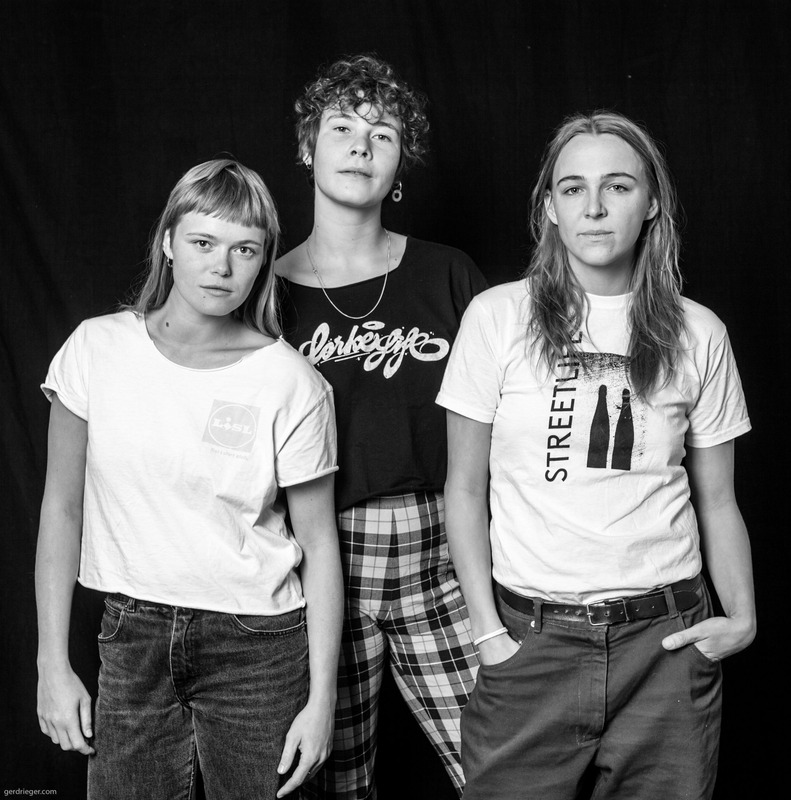 Also it was important for us not having a perfect-looking medium at the end, because streetlife and DIY is not glamorous and has it’s perspective of reallity, it’s Kind of dirty and casual. Likely a little bit punky. Are you planning to make more issues? Meike: We definately have a plan on making issue 2 in the future, but as Lisa-Marie moved to Hamburg for her Master it’s not easy to work closely together. But stay tuned! How was the feedback? Did you get a lot of support? Or was it like – „what the the hell are you doing“? Meike: Overwhelming. We made a release event at the „Dowgyallee“ (secret DIY spot in Münster) and Koloss Zentrale with a skatejam, beer and music. The organisation of this event became a group thing with a lot of help from everyone. All proceeds we raised went to both organisations Lisa and I are volunteering for. * In the end we could spend 1000 Euros – never imagined this amount could be made possible. Everyone was enjoying this special day as a dedication to skateboarding, streetlife, DIY and friendships. You also worked pretty closely with the printer, how was that? Meike: Julian and Hendrik from TAKK design (also based in the Koloss Zentrale) were super transparent in the different processes, which was important to us. We wanted to follow the steps in making the magazine – thanks again for making that possible boys. Print is dead? What do you think? Meike: In times of social media everything runs pretty fast and you can find and see nearly everything on the internet – but it’s not timeless. We chose a print medium to make sure everyone can have the print in their own hands after 20 years again and show it to their children or friends and say: this was us, that’s what we did! Lisa-Marie: So we don’t think print is dead, if there are people like us in the world who still love to print. Its a passion like skateboarding and if you keep on loving it you keep it alive. 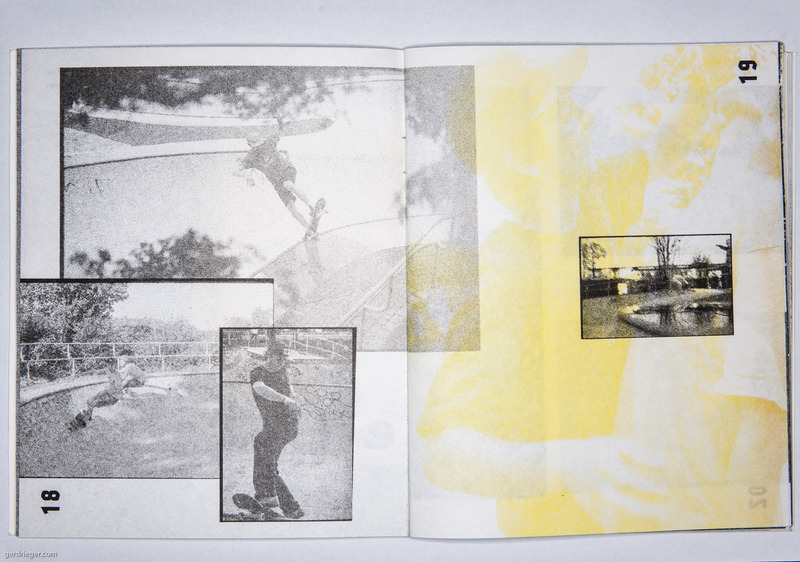 Why make a zine? What´s fun about it? Why should everyone do one? 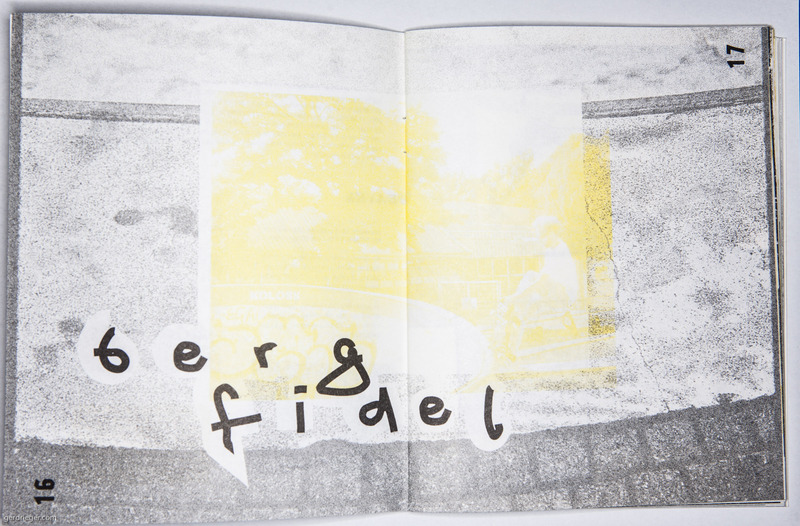 Meike+Lisa: From the basic idea to the final magazine in your hands you’ve got to go a long way. First thing is to decide and pick out what should be in there, how much space can we use – not that easy as we had a huge amount of pictures. Finding a „Look“ which runs trough every page and layouting itself is a lot of fun. Also handling the printed pages on our own was a groupwork which brought us a really good but sweaty time: we had to cut the different pages, fold it in the correct order and staple them. There were a few nightshifts but if you do it with friends and vivid music there can be nothing more fun. Shoutouts, Thanks or anthing else you wanna say. Thanks to all the boys and girls who helped us and spread the word. Thanks to Julian and Hendrik from TAKK, Markus and Johan from Koloss, the Dowgyalle and BTC boys and everyone who supported the idea. Parting shot: The gang – Lisa, Lisa-Marie and Meike in the Bailgun studio.